Salomè is a historic turkish marble, used in the past for historic buildings and columns. Today the availability has decreased but this marble is still very used and appreciated. 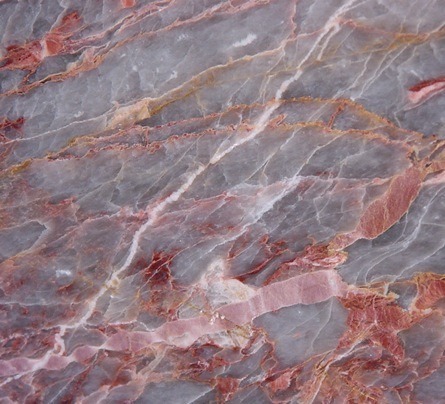 The Salomè characterised by a dark grey background with many red, pink, withe and also golden veins. The contrast between the intense color of the veins and the dark background gives elegance to the surface of the slabs, which is better appreciable when they are polished. The Blocks of Salomè are usually medium-small sized and the slabs are usually resined. Ziche resins these slabs with triple vacuum epoxide resin, in the modern factory of Brescia (IT). This process enhances the structural quality of the Salomè, protecting its beautiful natural color. The Salomè is commonly used for indoor or outdoor floorings, claddings, ventilate facades, countertops, stairs,..